Carrier ampholytes (CAs) are essential for isoelectric focusing (IEF) separation of proteins. The fundamental requirements of good CAs for IEF applications are good pH linearity, high buffering capacity, small ΔpK (less than 4), good stability, and insignificant influence on the sample. Since early CAs were developed before the introduction of imaged capillary IEF (iCIEF), the unique requirement of low UV absorbance could not be applied in iCIEF application. In addition, interaction of CAs with protein in gel media and solution phase is different. Therefore, it is advantageous to have CAs for iCIEF with low protein interaction in solution phase for reproducible iCIEF protein separation and with low UV absorbance for minimized electropherogram baseline noise. Aeslytes were developed specifically for protein high performance iCIEF separation based on our extensive research. In addition to meeting all the requirements of good CAs, such as good pH linearity, high buffering capacity, good stability, low protein interaction, and low UV absorbance, Aeslytes are composed of a remarkably high percentage of effective CAs with small ΔpK which provides faster focusing and more stable pH gradient. Proteins are so complex, and they react differently with CAs, depending on the functional groups of CAs. Therefore, AES developed two series of Aeslytes that possess different basic functional groups to minimize protein interaction. Aeslytes are available in High Resolution (HR) and Super High (SH) performance series. Both HR and SH Aeslytes are good for iCIEF of monoclonal antibodies (mAbs) (Figure 1), fusion proteins, antibody drug conjugates (ADCs), dairy proteins, meat proteins, and seed proteins. SH Aeslytes are especially good for iCIEF of acidic fusion proteins (Figure 2), dairy proteins, meat proteins, and seed proteins; while HR Aeslytes are notably good for neutral and basic fusion proteins. The separation efficiency of some ADCs is improved when mixing SH and HR Aeslytes (Figure 3). Aeslytes (HR and SH) are both provided at broad-range and narrow range pH intervals. Broad range Aeslytes allow for a universal iCIEF method for a range of proteins with different isoelectric points, and delivers fast focusing of proteins. Narrow range Aeslytes provide higher separation efficiency at the cost of slower focusing of proteins (Figure 4). Specific iCIEF methods have to be developed when the pI of proteins is in different ranges. Aeslytes have demonstrated superior focusing and low UV noise. 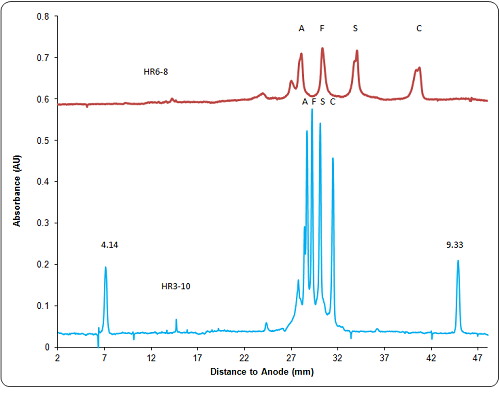 Figure 5 illustrated focusing of 6 pI markers with Aeslyte SH pH 4-8 and pH 3-7 from another vendor. Much higher baseline noise was observed from the electropherogram with CAs from the other vendor, and pI 5.85 did not complete focusing with CAs from the other vendor under the same experimental conditions. Aeslytes allow direct coupling of iCIEF to a mass spectrometer (MS). Aeslytes are developed to be MS compatible (contain low salt ) and have an extremely high percentage of good amphoteric components. High protein iCIEF resolution can be achieved even with very low Aeslyte concentration (0.5%). These advantages greatly minimize possible interference of MS signal by salts and CAs. In addition, “widened” protein peaks with narrow range CAs help with mobilization of focused protein peaks into the transfer capillary, further reducing protein remixing.